integration, or to walk away and follow the path of authoritarian illiberalism. Poland, is quite a gamble on the part of the Luxembourg court. which EU Institutions have now no other choice but to stand firm and keep calm. the Polish crisis is acutely visceral and radical. of a procedure, but they are mostly used to suspend the effects of EU acts. scarcely requested and, as a result, hardly ever granted. probably, in the course of an oral hearing. moment of entry into force of the Act. has been slowly and carefully brewed in the Luxembourg futuristic anneau. in Luxembourg are ultra vires and not applicable in Poland. 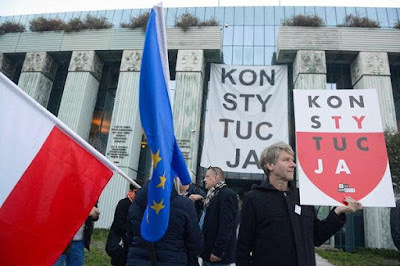 imposed and Poland will refuse to pay following the ultra vires rationale. government is not only risking their benefits, but even their European Union membership.